Here I am on the last of my 5 day Easter staycation and today has been a committed pyjama day. I’ve lazed about with Audrey for a bit, been inspired by a couple of episodes of The Great British Bake Off Series 1 (the series I missed!) and am starting to prepare for a work trip tomorrow with a bit of feel-good Whoopi Goldberg (in Sister Act II) in the background. Quite frankly, it’s a rather fab way to finish things. But the long weekend has not been spent in a haze of nothing-ness and sloth. I’ve caught up with friends, been for a flotation tank session, and added a couple of newly discovered gems to my figurative album of London Love. I wrote about my dip into Camden Market in my last post and on Saturday I immersed myself in another cultural melting pot with a tour of the Houses of Parliament. As I walked through security and emerged on the other side of those black iron gates, I felt a little frisson of excitement. I was soon to learn that entry to the Palace of Westminster is not restricted to those on tours but I felt the sense of history and importance enfold me in its gothic embrace all the same. The tour was absolutely amazing. Meeting our guide in the magnificent Westminster Hall, we headed up the stairs and along the corridors to start our story in the Norman Porch right at the top of the stairs where the Queen herself enters each year for the State Opening of Parliament. 75 minutes of anecdotes, architecture and atmosphere later we left the Commons Chamber and headed back to Westminster Hall to be surrounded by King William Rufus’ 6ft thick walls from 1097, the place where it all began. 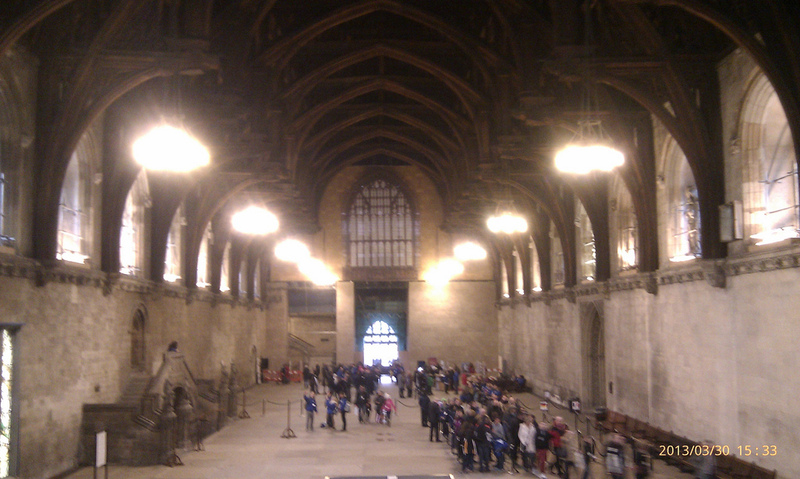 Westminster Hall looking back towards the entrance. For the first half of the tour, we scuttled along behind our tour guide in the footsteps of our sovereign, from the top of the stairs under the Norman Porch through the Queen’s Robing Room, down the Royal Gallery and into the Lords Chamber. We stopped to marvel at the copy of the Magna Carta and the death warrant of Charles II and gazed at the massive portraits of the Battles of Trafalgar and Waterloo in the Royal Gallery. The Lords Chamber was quite spectacular. The throne is the piece d’resistance, covered with gold and filigree and is in stark contrast to the Woolpack in front of it, the seat of The Lord Speaker and a homage to the importance of wool in Britain’s economic past. 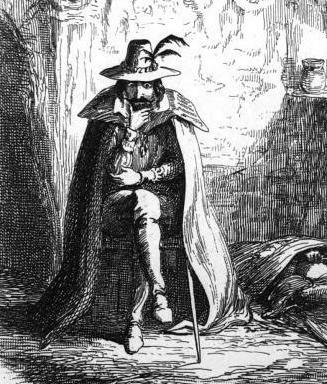 It was also under the Lords Chamber that the Gunpowder Plot was foiled. The plot was aimed at killing the Catholic sovereign King James I by blowing up the Palace during the Opening of Parliament in 1605. A ceremonial check is still carried out as part of the State Opening preparations to ensure that no gunpowder lies beneath the Palace and the plot’s failure is celebrated each year on November 5th with effigies of the captured traitor Guy Fawkes burnt on bonfires around the country. After an explanation on the ceremony surrounding the State Opening of Parliament and a tally of the roles of the various types of Lords, we were off again, down the Peers Corridor, towards the Central Lobby. Did you know that the word ‘lobbying’ was first coined to reflect the activity in this space? 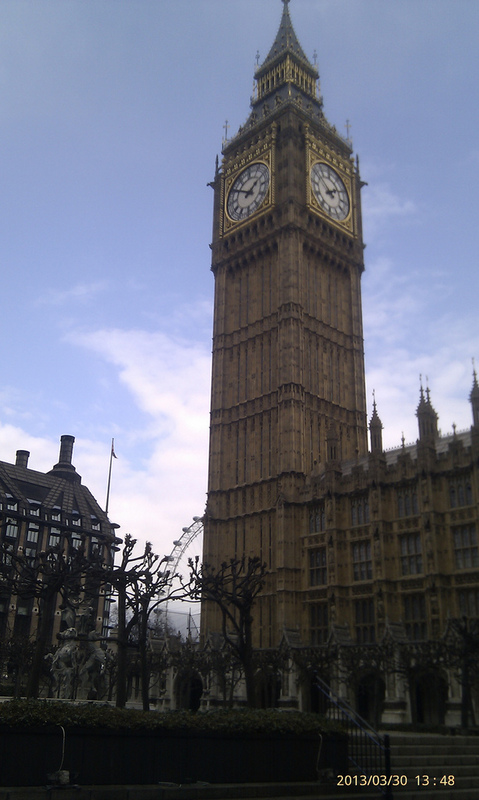 It’s the place where any voter can enter and request to speak to their Member of Parliament via the Reception Desk located there – members who are present in the ‘House’ are obliged to come to the Central Lobby to meet their constituent who ‘lobbies’ them although it might pay to check that they are ‘in’ before traipsing down to Westminster and being subjected to security screening. A hurried scamper down the Commons Corridor brought us to the Members’ Lobby, a working space for the parliamentarians complete with electronic message board and four rather formidable statues of Britain’s former Prime Ministers – Clement Atlee, Winston Churchill, David Lloyd-George and Margaret Thatcher. And this segues nicely into our next stop and the penultimate section of the tour – the Commons Chamber. The House of Commons is comprised of our Members of Parliament (MPs) who are elected by voters in their respective constituencies. This is where David Cameron, Nick Clegg, Ed Milliband and their ministers meet to debate the issues of the day, initiating and amending laws (called Bills) which pass to and from the Houses of Lords and Commons through quite a series of checks and balances before coming into legislation. Voting in the Houses is also very transparent with the positions of the Members shown by their physical movement out of the Chamber into two neighbouring passages known as the Yes and No Lobbies. (In the case of the Lords, these are the corridors of Content or Not Content). Finally we found ourselves back in Westminster Hall. The hall has served many purposes in its 1000 year history including housing the Law Courts, hosting famous speakers like Nelson Mandela and Pope Benedict XVI, the first visit by a Pope since the Reformation in the 16th Century, and the laying in state of the Queen Mother following her death in August 2009. Britain’s links to the rest of the world were laid bare in the entertaining story-telling of our guide, Isabel and with my head crammed full of fascinating facts and anecdotes, I was glad that I’d decided to invest in the official guidebook so that I could revisit our political past in far more detail and at my leisure. With the tour over, it was time to brave the chill outside again and with my guidebook tucked firmly under my arm, I couldn’t wait to get on the tube and lose myself between the covers. Certainly when I next emerge from Westminster tube station – to be greeted by Big Ben and the gothic spires of the palace – it will hold a whole new meaning for me and getting in to Prime Minster’s Question Time might just be next on my To-Do List of London. Unfortunately, there are no photos permitted once the tour leaves Westminster Hall but there is an official flickr site if you’d like to see more. I’ve also reviewed the Tour on Weekend Notes so for a slightly different perspective (as well as information on costs and opening times), click here. This entry was posted in London Love, Westminster Palace and tagged Gunpowder Plot, Guy Fawkes, Houses of Parliament, Kindle, politics, The Great British Bake Off, Westminster Palace by Kym Hamer. Bookmark the permalink.